The craft hard cider producers on the Central Coast, with nearly a dozen in San Luis Obispo County, are out to change the perception that hard cider tastes like apple cider for adults. They did that and more at the 3rd annual Central Coast Cider Festival in Atascadero, where cider producers and cider fans gathered for fun experiences designed to increase education and appreciation on both sides of the bottle. The way we see it, the Central Coast is poised to take its place as an epicenter of hard cider creativity, craftsmanship, and innovation. And we couldn’t be more excited. 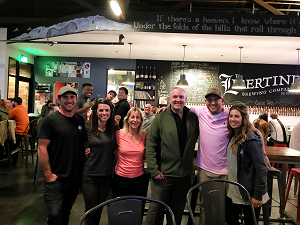 Neil Collins, founder of Bristols Cider, and Flavor Team member Kara at the tap takeover event at Libertine Brewing Company in San Luis Obispo. 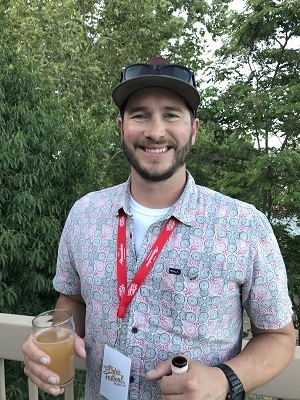 Neil Collins, whose Bristols Cider House in Atascadero was one of the original cider producers instrumental in starting the Central Coast cider culture, believes the Cider Festival is about education and sharing ideas. 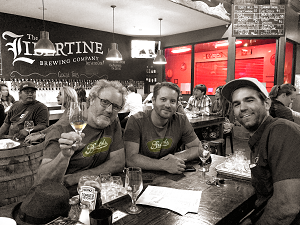 Neil Collins and Weston Hartley from Bristols Cider and Connor Meznarich from Jean Marie Cidery at the tap takeover. 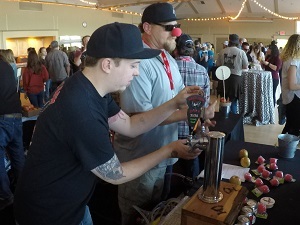 The Cider Festival’s grand tasting on Saturday May 12 was preceded by tap takeovers and pouring events. The Gopher Glen Cider team Jake and Raven Lukehart-Smith (left) and Jesse and Collette Smith (right) with Flavor Team members Kara and Andrew. 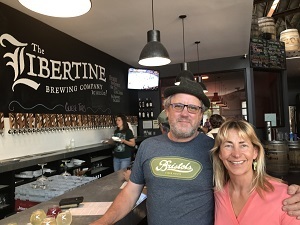 At the Guest House Grill in Atascadero and Libertine Brewing Company in San Luis Obispo, cider makers shared several of their ciders with fans who wanted to get a sneak taste. It was great to taste a range of ciders and talk with the makers about their process and inspiration behind the ciders. A cider pouring event at Grape Encounters Empourium in Atascadero was another opportunity to try new ciders. 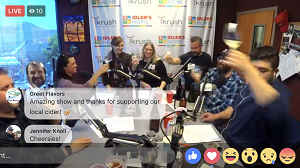 The Cork Dorks (Liquid Lunch) radio show at The Krush 92.5 brought in several cider producers, including Gopher Glen Cider, Two Broads Ciderworks and Tin City, to discuss the current state of the craft cider industry and share ideas of where it’s going. 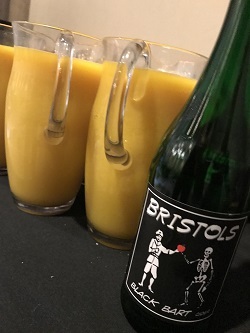 Attendees enjoyed cidermosas (made with Bristols OG cider), a buffet breakfast, conversation, and panel discussion about using hops in hard cider. Several producers in the collegial group of Central Coast cider makers presented the inaugural Cider Brunch Seminar held Saturday morning. The topic was hopped cider and exploring the ways this herb used in many beers is now crossing into the cider world. Before the discussion started, attendees enjoyed cidermosas, a buffet breakfast, and conversation. Neil Collins, owner of Trees of Antiquity, kicks off the panel discussion at the inaugural brunch seminar discussing the use of hops in hard cider. Neil Collins, owner of Paso Robles-based orchard company Trees of Antiquity, kicked off the panel discussion. He has grown cider apple trees and other varieties since he started his business in 2000, and he’s seen firsthand how the cider industry continues to grow. 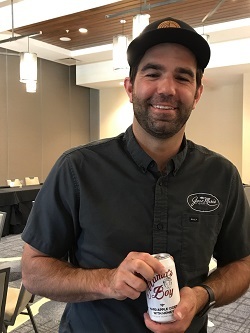 Connor Meznarich from Jean Marie Cidery produces hopped and other ciders in cans. 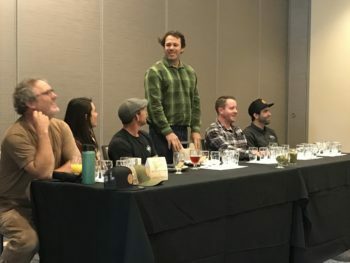 Next, the panel of cider producers—Bristols Cider, Gopher Glen Cider, Jean Marie Cidery, and Tin City—took turns discussing their evolving ideas of hops –the why, when, how of including hops during the cider-making process, and the results of their efforts so far. We followed along through the tasting of six ciders as each producer shared more about the hops they chose, their flavor characteristics, how hops affects the fermentation process, and other aspects of using hops in hard ciders. Several audience members asked questions of panel members. “We’re all finding what works for the region, the country, and for our own individual companies,” he added. 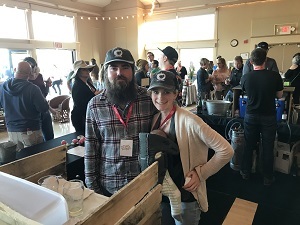 Held again at the scenic Pavilion on the Lake in Atascadero, the Central Coast Cider Festival included tastings from more than a dozen cider producers, a traditional roast pig dinner from Chef Jeffery Scott with Vineyard Events and great music from the Turkey Buzzards. Dane Jacobs with Reef Points Hard Cider shares one of their new ciders at the Central Coast Cider Festival. But the event isn’t just for attendees to sample hard cider—it’s also a gathering place for cider producers to share their results and explore what’s possible. “Here in the US, we can play with cider more,” said Collins, who came to the Central Coast from Bristol, England. All evening, the energy in the room was upbeat, as attendees made their way from booth to booth, sampling the wide variety of ciders, eating dinner, and talking on the patio overlooking the lake. 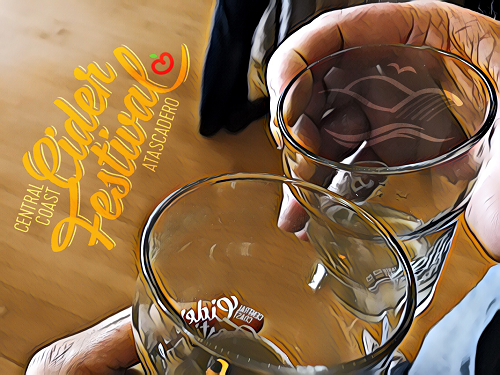 While taking a short break during the event, Collins shared his thoughts about the Cider Festival’s intention. Noah Selman with Krazy Farm Cider serving fans at the Central Coast Cider Festival. As the evening wrapped up, Raven Lukehart-Smith with Gopher Glen Cider summed up her experience of the event. Anna and Dominic O’Reilly of Anna’s Cider pouring for the first time at the 2018 Central Coast Cider Festival. Over the past two years, we’ve enjoyed seeing cider producers continue to explore the range of what’s possible and explore new ideas. As cider fans, we couldn’t ask for more and we all benefit from their passion, excitement, and enthusiasm in this industry that is anything but status quo. 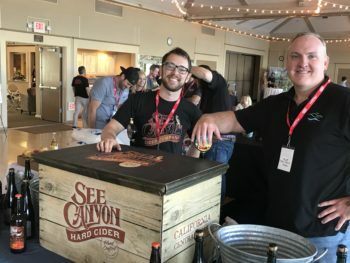 Nate Adamski with See Canyon Hard Cider and Flavor Team member Andrew. The Flavor Team thanks the organizers and sponsors of the Central Coast Cider Festival, all the producers for sharing the fruits of your labors, Chef Jeffery Scott, the Turkey Buzzards, and fellow cider lovers for a great experience.